Arvind Kejriwal's Nocebo Mantra and why you can't ignore him! It will be a big mistake to underestimate Arvind Kejriwal's impact on the upcoming Lok Sabha elections! Ever since he started his political campaign, Arvind Kejriwal has been two steps ahead of his competition. Be it his innovative use of social media to reach young voters, banners on autos across Delhi city or the incessant radio campaign amongst other things - his political rivals were always playing catch-up and it showed in the results of the Delhi elections. A major part of Arvind Kejriwal's educated fan base has deserted him but he still magically manages to find new admirers and fanatic followers. Free from the burden of the CM's chair, Arvind Kejriwal now seems to be in a hurry to reach out to a wider pan India audience. Post his resignation, he has already starred in (pun intended) two prominent interviews by two top journalists of India, Barkha Dutt and Rajdeep Sardesai, both incessantly promoting those interviews on Twitter ensuing loads of free publicity. Kejriwal cleverly seems to avoid Times Now though. And the best part, all the uncomfortable questions that people had for him, he let Barkha and Rajdeep ask on their shows and answered them without fear. Whether the answers were convincing or not, his conviction is all that seems to matter now. He even did the unthinkable by sharing on Twitter a spoof video song made to ridicule him. The after effects of which are quite hilarious where the guys who made the video, out of utter shock or joy, tweeted that they will now vote for him. One more vote bank captured - the comics on Twitter, a very critical element that shapes public opinion online in a jiffy. 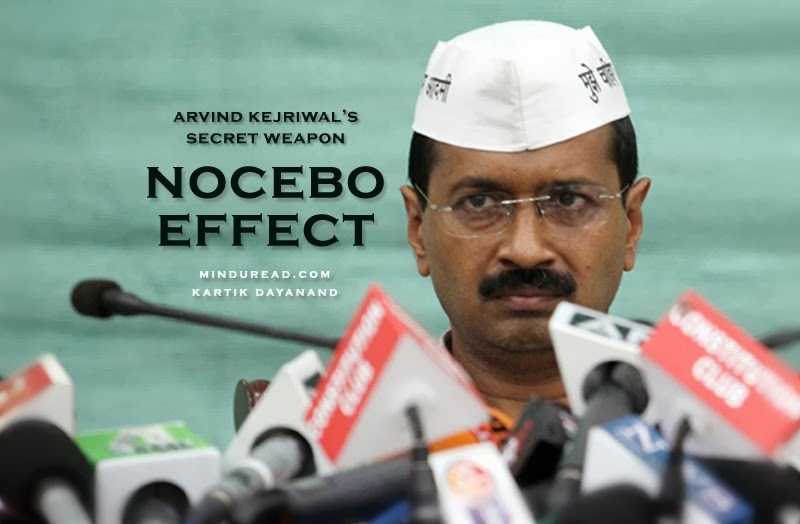 But, the real secret behind Arvind Kejriwal's unstoppable juggernaut is a simple secret ingredient - The Nocebo Mantra or Effect!